One of her little jests was that it should be left up to me, the bookworm, whether to dump the Sun-Times library card catalog or save it. The cards, that is. Not the squat little wood cabinet. That I wanted to take to decorate my home office. The cards make it far heavier. I could get rid of them, lighten the load, and use the long thin drawers to store small objects. But that would mean trashing the labor of countless hours of work of untold librarians. A unique trove of information. One of the many questions, logistical, emotional, almost ethical, facing moving a newspaper — two newspapers, that is, the Sun-Times and the Reader — a mile due west and five blocks south. From Wolf Point to the West Loop, as the Sun-Times moved its offices over the weekend. Our fifth home, by my count. Founded as the Chicago Sun in 1941 and published at 400 W. Madison. Merged with the Chicago Times in 1948 and relocated to 211 W. Wacker. Into its own modern trapezoidal gray barge at 401 N. Wabash in 1958. Then to the Apparel Center at 350 N. Orleans in 2004. And now, as of Sunday morning, open for business at 30 N. Racine. The result of being sold to a consortium led by former Ald. Edwin Eisendrath and paired up with another company, Answers Media, sharing their video and sound production facilities. A retrenchment, one might think. Survivors, into the citadel! Boil cauldrons of oil and defend the crumbling walls of professional journalism! The logic is clear: smaller, less centrally located office space equals lower overhead equals a better chance of survival for the newspaper (whoops, dynamic multi-platform synergistic storytelling system). 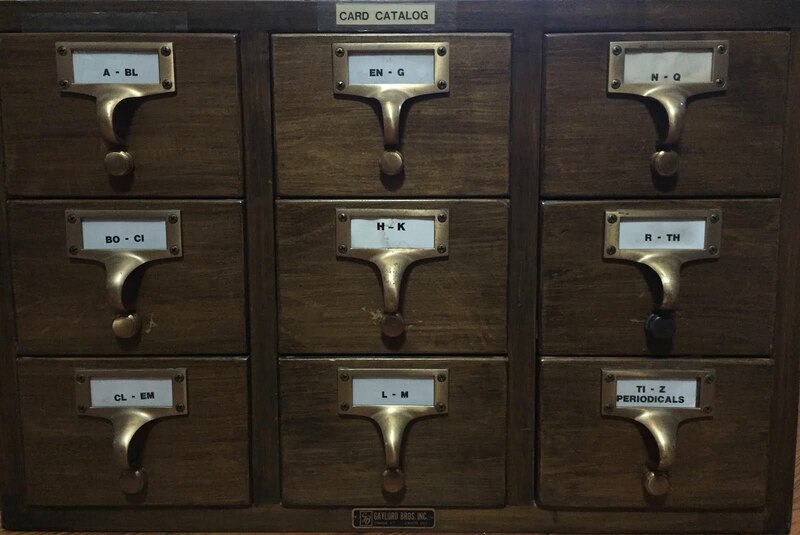 Odd thought but I still remember the first time I went to the library and wanted to look for a book in the card catalog and was completely puzzled that it wasn't there. 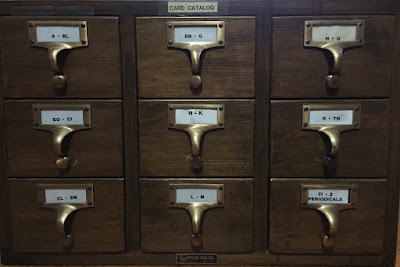 I asked the librarian, "Where is the catalog?" It was so strange to me. "Almost ethical." Love it. I'm going to try to insert the phrase into as many conversations as I can. It can mean so many things. Neil used it to foreshadow and excuse his decision to dump the cards, thus destroying the work of "countless hours...of untold librarians." But since none of those librarians was in any way harmed by the destruction, the decision was not in the realm of ethics (however close it might have come to its borders), but rather in the kingdom of sentiment. I, who can weep over maudlin moanings of my teenage self, could not have destroyed the cards. Neil is among those happy few who do not make big investments in useless sentimentality. However, the phrase need not be limited to Neil's usage. One can immediately grasp its utility in discussing politics, particularly our local politics, to describe some convoluted quid pro quo actions salted with social benefits. And going to the top of the stairs, perhaps some of POTUS's tweets could be described as "almost ethical." And some not. I love your positive outlook on life, Neil. Very healthy. I will point out one thing, though; it's going to be a bit of a slog through the slop getting to Harry Carry's this winter. That it will. But I'll get there. Somehow. I'll swing past the dynamic multiplatform synergistic storytelling system and pick you up. As I read your column today about the Sun-Times move to new offices, I was having breakfast with my wife and listening to a vinyl album on my turntable. I love this morning ritual and today you were an enjoyable part of it. Next week I retire, so you can guess my age. Perhaps younger generations have not picked up the newspaper habit, at least yet. But notice the resurgence of interest in vinyl LPs and the return of turntables. People have rediscovered the tactile pleasures of having black spinning disks and the insider appeal of reading album cover liner notes. Newspapers, like broadcast TV, may never be the same behemoths of popular culture they once were. But I wouldn’t underestimate the inherent magic of scanning fields print and feeling the fresh slap of headlines, all with the reassurance that you have survived another day to read about it in your home. Besides that, you can’t wrap fish in pixels. I have a ton of 78's too. thought of converting them to CD's, but as long as my old turntable holds up, what's the point? 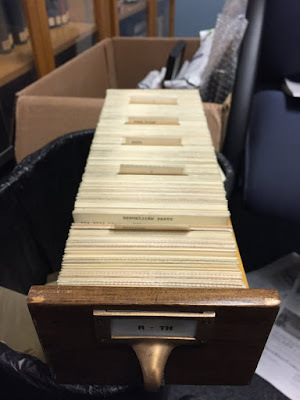 One guesses the "countless hours of work of untold librarians" embalmed in the cards has long since been digitalized. Making Neil's final gesture less heartless than it seems. Talk about the inevitable demise of newsprint brings to mind the explanation Neil once coined to explain the concept of home newspaper delivery to the cyberized young: "Sort of a website they fold over and through at houses." What a wonderful thing is metaphor. Me. I would have picked the cards for a few favorite titles ( no more than half a dozen) and kept those cards framed...maybe in a custom frame on top the cabinet. Dumped the rest. I'm sentimental but not a hoarder.